As the leadership in the House of Representatives is soon to be turned over to Democratic control come the new year, predetermined members are set to take the reigns of power. Members include the soon to be Speaker Nancy Pelosi and the one and only Representative Maxine Waters - who is set to take over as Chairwoman of the House Financial Services Committee for the 116th Congress. Last Friday, Waters wrote in a statement, “I am honored to have been selected by my colleagues to be the first Chairwoman of the House Financial Services Committee in the 116th Congress." Here are a few reasons why Representative Waters holding the Chairwomen responsibilities would result in absolute chaos. Along with Rep. Waters's frequent rants, temper tantrums, and directing violence against her political targets, most notably President Trump and administration officials, she has also held suspicious special interest ties of her own. Many of those ties include "pay-to-play" politics which entailed setting up "meetings" for OneUnited Bank, which ironically her husband owned stock in, with the U.S. Treasury. 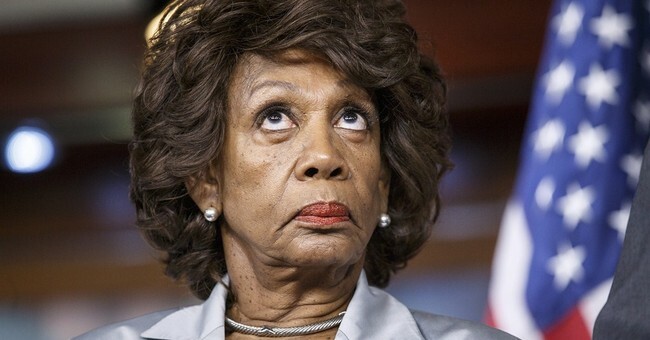 While there were no findings by the investigation, which was reported back in 2012, Waters to this day has faced fair questioning regarding her ties to banks and investments which she claims to have used to purchase a lavish multi-million dollar home, which lies outside of her congressional district in California. Representative Waters most recently responded to the questioning of her wealth and investments, by calling out Tucker Carlson who dared to ask the question about where she had accrued her millions. Waters responded by calling Carlson nothing more than a "racist" for asking. This style of rhetoric and name calling those you disagree with a racist solves no problem but further drives a wedge in the country. Further reasoning behind why Waters isn't fit to serve as Chairwomen of a powerful "A" committee, is due to her willingness to incite violence by urging supporters to make members of the Trump administration "not welcome" anywhere. Threatening lives through the use of violence makes her no better than the left-wing violent Antifa "activists." “If you see anybody from that [Trump] Cabinet in a restaurant, in a department store, at a gasoline station, you get out and you create a crowd and you push back on them! And you tell them that they are not welcome, anymore, anywhere,” Waters declared. Even Senate Minority Leader Chuck Schumer pushed back and stood up to Representative Waters for her calls to incite violence against political opponents. Another reason, why Representative Waters would not be the ideal candidate to lead a committee, is the use of the "race card" tactics that divide up fellow Americans against themselves based on their respective skin color. As Dr. Alveda King, niece to Dr. Martin Luther King Jr. discussed, on Fox News this past May, the concern she has with Rep. Walters being in the "wrong" for continually "playing the race card..." "again and again." Politically motivated and spite filled investigations from Waters would be the sole focus of her as the Chairwoman while aiming at the California based bank Wells Fargo and a German Bank, Deutsche Bank, which has ties to President Trump from loaning him money. Here is a brief background on Deutsche Bank. After President Trump "stiffed" banks in New York in his early years after declaring companies bankrupt, he would later go to Germany's Deutsche Bank to acquire needed loans to embed into this real-estate ventures. Tries between these two parties have long been under scrutiny for what the left supposes could've advanced itself into a money laundering scheme, that hasn't been uncovered or proven. With Republicans controlling both the Senate and the White House, don't expect a raft of progressive legislation in the next two years. But Waters doesn't just have an aggressive oversight agenda — she also has subpoena power, and she won't be afraid to use it. Deutsche Bank is deeply intertwined with both Donald Trump and Russian money laundering; it has much to fear from Waters. Reuters, also reported that there's a newly proposed subcommittee with the sole focus on "diversity and inclusion" within the financial sector. Rep. Waters without question seems to be out of touch with current events as well. While maybe funny, being out of touch with America is a horrible attribute for someone not only representing constituents but also in charge of significant oversight power over the insurance and banking industry among others. This statement from Waters was absurd; replace Korea with "Crimea" and she would've been correct. And finally, how could we forget about "Trump Derangement Syndrome" which includes her frequent and frantic calls on Congress to impeach President Trump.